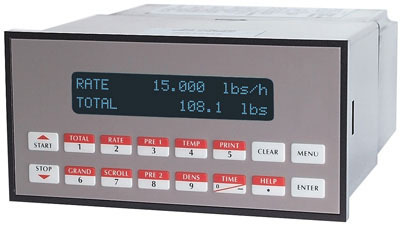 The Hoffer HIT-4G is a microprocessor-based gas flow rate indicator and totalizer with data logger and Modbus Communications Protocol. 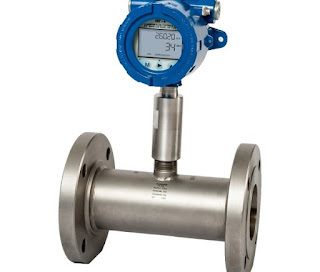 The HIT-4G provides temperature and pressure compensated gas flow measurement. Featuring a 6-digit rate display and separate 8-digit resettable and non-resettable flow totalizers, the HIT-4G is configurable for 4-20 mA loop power or DC power. The instrument can accept a low-level signal from a magnetic type pickup coil, a DC pulse signal, contact closure or modulated carrier pickup (MCP/RF). Pulses from the signal input are converted into volume and rate values based on flowmeter calibration settings stored in the instrument. Temperature, pressure and compressibility compensation may be used to calculate corrected volume and mass flow. The total and flow rate are displayed on a two-line liquid crystal display (LCD). A 4-20 mA analog signal proportional to the flowrate is output on the current loop. The HIT-4G is configurable from the instrument front panel keypad or via Modbus communications. Contact Flow-Tech, Inc. for more information. Hoffer Flow Controls HIT-4G Gas Flow Rate Indicator & Dual Totalizer With Modbus & Data Logging from Flow-Tech, Inc.
Labels: Dual Totalizer, Flow Computer, Gas Flow, HIT-4G, Hoffer, Indicator, Maryland, MODBUS, Rate, Virginia, Washington D.C. 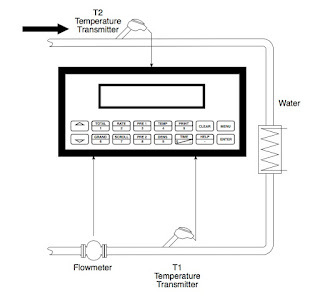 Typical Heated/Chilled Water Metering System Using Magnetic Flowmeter System, Two Temperature Transmitters and Electronic Flow Computer. If remote metering is required, a remote PC, modem, and remote metering software may be used in conjunction with this. The flowmeter is sized by the manufacturer based on the expected line size, fluid and flow rates anticipated in the application. This would normally require the line size, flow rate range and expected line conditions of temperature and pressure be known. The temperature transmitters are selected for a measurement range that will meet or exceed the range of temperature to be encountered in the application. The flow computer performs the necessary calculations needed to compute the energy flow (BTU’s or ton-hours) from the electrical signals being fed into it. The optional data logger and modem permit the remote monitoring of those signals and the data logging of the measured and computed values. A remote PC with modem can access the information either in the data logger or in the current readings of the flow computer. The flow meter, flowmeter, the transmitters and the flow computer are calibrated by their respective manufacturer’s prior to being supplied to a utility company in accordance with the instructions provided when the units are purchased. During installation the two temperature transmitters and the flow computer are installed in accordance with industry guidelines and manufacturers instructions. The individual calibration and setup documents provided by the manufacturers are reviewed. During startup the individual components of the systems are setup so that they operate correctly. For the transmitters this will normally involve double-checking of each transmitter range and optional features using a hand held terminal. 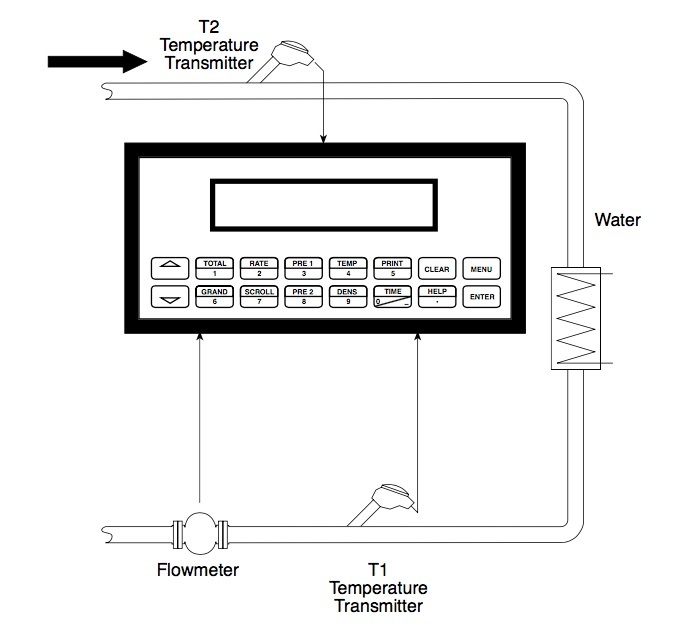 The flow computer will be setup by entering the information on the flowmeter, and with the ranges of both temperature transmitters. In addition, the desired items to be included in the data logger will also be setup. This is usually done by the front keypad although connecting the device to a laptop and using an external, special program supplied by the manufacturer could also be used. The setup of each individual input item is verified. For each measurement, there is a transmitter to scale and send an electrical signal to the receivers that need this information. The scaling of each transmitter must also be set into the corresponding flow computer input channel. If a change is made to one, it must be made to all. The basic operation of the system can be verified by checking that the respective sensors are producing the correct signals, based on the observed signal, the flow range setup in the sender and receiver of the informa- tion, and the observed process conditions in the line. Signal simulators and multi meters may also be used. When using voltage or current ranges for the flow input, there is a “low flow cutoff” that should be set to prevent the system from metering when no flow is present. This is also limits the low flow measurement range so it is usually set to the lowest practical value. There is also a low temperature cutoff that can be used to prevent the false totalization of energy when small differential temperatures are indicated while recirculating water. Meters may be read either locally by taking a reading off the flow computer or remotely by taking a reading off the flow computer by modem or by reading the data logger or both. The operational status of the meter system is also checked periodically. Often a utility will perform various inspections each year on each energy meter. Manufacturers of the compo- nents used in the system provide a number of service and test aids for Service personnel that permit them to interrogate a component to determine if it is operating properly. From time to time problems may occur in any system. The transmitters, flow computer, and data logger usually have some diagnostic capability and can assist in problem detection and notification. If it becomes necessary, for any reason, the flowmeter may be changed out. This sometimes occurs when the heating load changes or the actual flow range is different than the expected range as a result of inaccu- rate sizing information. When a sensor change out occurs the information on the new flowmeter must also be set into corresponding transmitter and the flow computer flow input channel. If a change is made to one, the change must be made to all. If a transmitter is changed by either replacement or re-scaling or re-spanning then the new scaling of that transmitter must also be set into corresponding flow computer input channel. If a change is made to one, the change must be made to all. Most utilities remove portions of the meter system from service after several years for recalibration. The flow computer can usually be checked in place using simulators. They can be removed from service if needed and replaced with another device that then must be setup for use as described earlier. In other cases, the transmitters are replaced with a calibrated replacement unit. Kessler-Ellis Products (KEP) offers the Supertrol 2 Flow Computer for Heated or Chilled Water Metering applications. It is available in a variety of housings to suite a wide range of application environments. For more information on KEP products follow this Flow-Tech link or call 410-666-3200 in Maryland, or 804-752-3450 in Virginia.